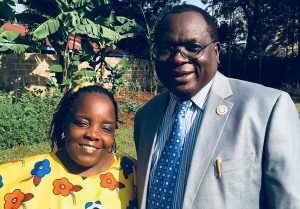 Western Kenyans Patrick and Silira Muganda founded Study Observe and Teach Mission (SOT Mission) in 1996 to rescue orphans who had lost parents to the devastating AIDS epidemic in Africa. Their work began when Patrick saw two children on the streets of Kakamega, Kenya 22 years ago. One was 4 years old, the other 3. They were dehydrated and had gone without food for three weeks. One of them was eating soil. For Patrick, there was nothing to do but find a way to make life better for these children. He took them to his house, fed them, clothed them, and took them to school. One of these two boys is now in his second year at the university. The other is in secondary school together with many other children who have been helped through SOT Mission. SOT Mission provides financial, social and academic aid to disadvantaged children in Kenya. These children typically lived on less than one dollar and one meal per day. Most of them are street children who lost their parents to HIV AIDs. SOT gives them uniforms, scholastic materials, and the payment of school fees so they can complete their elementary and secondary education. (Children in Kenya are not allowed to attend school without uniforms or payment of fees.) Being able to go to school can be the difference between living on the street and living a successful and productive life in Kenya. Currently, SOT is working with 20 primary schools and 15 secondary schools. Reverend Patrick L. Muganda was born in 1961 in the western Kenyan town of Kakamega. Both Patrick and his wife, Silira (also Kakamega-born), attended seminary and developed a deep Bible-centered Christian faith. They have their own four wonderful children, and they care for 35 orphans, recently placed with guardians in the community, and SOT remains responsible for all of their clothing, food, uniforms, school fees, and medical expenses. They also make it possible for another 275 disadvantaged children to attend school. Patrick and Silira are also involved in helping adults with HIV AIDS and adult guardians of disadvantaged children to provide for themselves by distributing seeds and fertilizer to them and teaching them how to grow enough food to sell some of it, eat some of it, and save the seeds to grow new crops the next season. They help adults get set up for “micro-financing.” These adults plant seedling vegetables and learn socioeconomic skills through agribusiness training which enables them to start small businesses so they can improve their household income and reach a point of self-sustainability. Patrick and Silira also speak to large groups of care-givers, encouraging them to establish kitchen gardens to alleviate poverty at their household level and to increase the nutrition levels of their children. For God to provide for the health, educational, physical and emotional needs of the children cared for by S.O.T. For God to touch hearts to support the mission of S.O.T. For God to open doors for partnership, locally and internationally with other Christian organizations, churches, and individuals. For God to provide wisdom, knowledge, and direction for Patrick and Silira. For a source of transportation, such as a van, for S.O.T. Mission’s travel needs. The SOT Ministry website can be found at sotmission.wixsite.com/kakamega. If you would like to support the Muganda’s ministry with ARM Ministries please click here.